Whether your lodging style is sublime Georgian elegance or cool modern, this one-in-a-million guesthouse, a short walk from St. Stephen's Green, serves up both—as well as the best made-to-order breakfast in town. 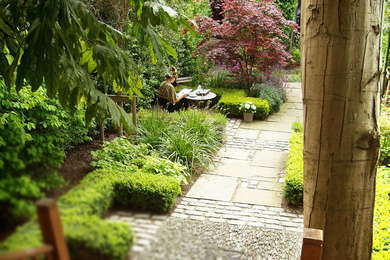 Once the home of Sam Stephenson, Dublin's most controversial Modernist architect, the contemporary mews coach houses and Georgian house that make up the property are connected via a small but beautiful garden. Tucked away on a small side road behind huge wooden gates, the phrases "oasis" and "hidden gem" get tossed around willy nilly by guidebook authors - but this B&B deserves them both, although in recent years the owners have realised this and charge accordingly. Rooms are split along the lines of the houses, into modernist or period. The majority are in the Georgian house, and are beautifully designed. No. 21 has a ceiling lofty and corniced enough for a royal. Of the modern rooms, Sam Stephenson's bedroom tucked away behind the lounge is funky and a must for fans. YOU SHOULD KNOW Because of the building's quirky history, there are no lifts or air conditioning. In hot weather some rooms can feel stuffy. Bathrooms vary in size and style, but are clean and functional, although some can be a little dark. You'll feel right at home (if your home is supercool and comfy, that is) in the sunken living room, with its black-leather sectional sofa, roaring fireplace, and interesting modern artwork. The reception desk is in the corner. While you sip wine or coffee and gaze at the fire, ponder on the famous guests who graced this room when Sam Stephenson, a famously good thrower of parties, was in residence - from Grace Kelly to Ted Kennedy. The guesthouse has no restaurant, but breakfast is absolutely great: fresh and delicious, with a range of "must trys", from the kippers to the cranberry loaf. There's an honesty bar in a mirrored nook in the sunken living room. The hotel is within walking distance of most of the sights, although it's a bit of a schlep to the river (but there are buses). One of Dublin's finest restaurants, Dax (3-minute walk), is nearby, offering period charm and French/Irish cuisine. Or at the other end of the scale and in the opposite direction, Canal Bank Cafe (4-minute walk) is a cute, casual all-day restaurant. The Barge Gastro Bar (9-minute walk) is a Dublin institution, an rambling pub with four bars and a reputation for impromptu sunny parties. Or check out the line-up at The Sugar Club (4-minute walk): it could be anything from a screening of Die Hard, with table service, drinks and pizza, to a competitive storytelling event, to a riotous New Orleans jazz band. Totally unique, there may be some slight drawbacks - the lack of air con in a heatwave comes to mind - but this is still a wonderful, incredibly quirky guesthouse with a gorgeous feeling of seclusion and respite, right in the center. Plus the breakfasts are absolutely top-notch.